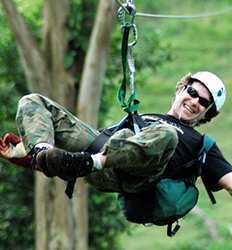 So if there is one tour that is absolutely synonymous with Costa Rica, it has got to be a canopy tour. Puerto Viejo, the Caribbean coast and the Talamanca mountains are home to not only the Original Canopy Tour in Costa Rica, but some of the best canopy, canyoning and rappel tours in the country. The origin of the canopy tours in Costa Rica began as a way for scientists and biologists to research the bio-diversity in the rainforest canopy. The Veragua Biological Research Station is located high in the Talamana mountain range above the Caribbean coast continues to do just that. 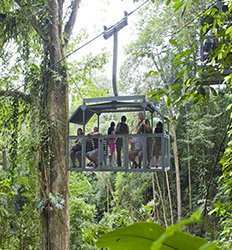 The Veragua Rainforest Park is also home of the Veragua Rainforest Aerial Tram and The Original Canopy Tour. Add in the incredible frog, butterfly and insect exhibits, nature trails and spectacular views from the top of the rainforest canopy and you understand why the Veragua Rainforest is our most popular family tour in Costa Rica. If you are staying in Puerto Viejo, the Terraventuras canopy tour is a perfect introduction to a Costa Rica canopy tour. For a full on rainforest adventure with all the adrenaline pumping action, our Caribbean Jungle Adventure combo is the perfect combination of a canopy tour, rainforest hike, waterfall rappelling and true canyoning in Costa Rica. Only the density of the Talamanca rainforest make all this possible on one super tour. Whether an Aerial Tram is more your style or an exhilarating rush from a zipline tour, the Caribbean rainforest canopy is sure to please everyone. Choose your favorite Puerto Viejo canopy, canyoning or rappel tour today! No visit to Costa Rica is complete without taking a canopy tour... in fact, they are so prevalent now that they have become synonymous with the quintessential Costa Rican rainforest experience. Fly like a bird with us, zipping high through the trees, on The Original Canopy Tour! The Original Canopy Tour deposit is $9.00 per Adult and $5.00 per Child. With a total of 2760 meters of zip-line cables, 23 platforms and heights of up to 270ft, it comes as no surprise that this Canopy Adventure in Costa Rica´s Caribbean region is a "MUST DO" attraction! This Canopy Tour from Puerto Viejo is not your standard zip-line canopy. Explore the jungle from a unique bird´s eye view!! Terraventuras Canopy Tour deposit is $10.00 per Adult, $5.00 per Child and $10.00 per Adult w/Superman. If you're looking for a unique eco-adventure in Costa Rica, look no further than our Veragua Rainforest Aerial Tram and Trails tour! Traversing the park's 3500 acres from canopy to forest floor we disembark the tram and pay a visit to the Veragua Biological Research Station! 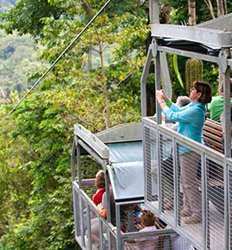 Veragua Rainforest Aerial Tram and Trails Tour deposit is $9.00 per adult and $5.00 per child. If you are looking for the most comprehensive rain forest experience in Costa Rica, look no further than the Veragua Rainforest Aerial Tram and Park tour! The aerial tram is our means of transport as we make our way through the jungle from top to bottom. The aerial tram is only a taste of what the Veragua Rainforest Center offers. This tour is "Drive Yourself", for more options see details. 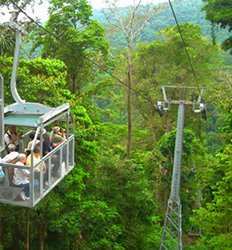 Veragua Rainforest Aerial Tram and Nature Park deposit is $10.00 per adult and $5.00 per child. Looking for adventurous things to do in Puerto Viejo? This action packed adventure combo has it all! 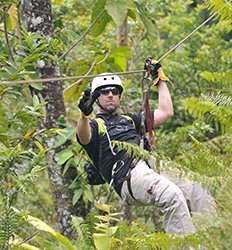 Canyoning, hanging bridges, zip lines, waterfall rappel, tarzan swing and even a 300 meter superman zip line. So grab your canyoneering gear and join us for an unforgettable Costa Rica adventure in Puerto Viejo! 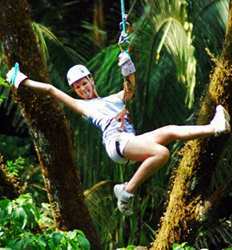 Caribbean Jungle Adventure Puerto Viejo deposit is $10.00 per person. Looking for the most complete tour of the Veragua Rainforest? Here´s your chance to experience the fantastic beauty of the Veragua Rainforest Park´s 3400 acres from a few different perspectives: up high, down low & finally at the speed of WHOOSH! The Veragua Rainforest + The Original Canopy Tour is the best combo deal in Costa Rica! !